Volunteering keeps you involved with ARMA board leadership. Volunteering provides you networking opportunities with other RIM Professionals and vendors. It's also a great way to help our community! Many thanks to our ARMA San Antonio chapter members, sponsors, and vendors, for assisting in the way that is best for you. An annual event co-sponsored with Credit Human is held on the Saturday after taxes. The community is invited to bring up to 100 lbs. of personal paper documents to be shred FREE. 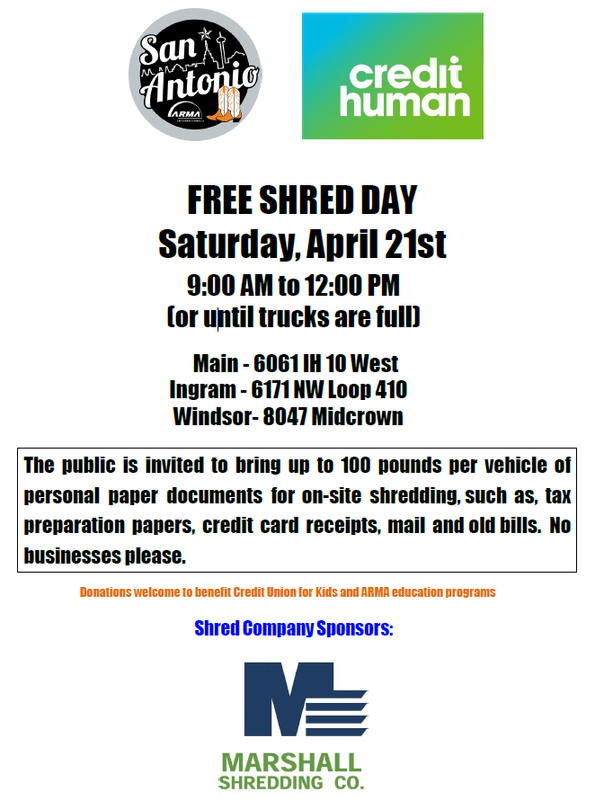 Volunteers from ARMA San Antonio, Credit Human, Shred Company Vendors and the community donate their time, equipment, and employees to make this event a huge success. In 2016 we shredded 51,815 pounds compared to last year’s 73,943 pounds, 78,733 in 2014, and 107,873 in 2013. Donations received this year were $943.25, last year $1331.82, $1718.63 in 2014 and $2623.77 in 2013. The San Antonio ARMA chapter receives one-half of the donations to be used for our educational program; the other half is given to the “Credit Union for Kids”. The SACU branch locations participating in Shred Day were Main at 6061 IH 10 West, Bandera at 8889 Bandera Rd, Windsor at 8047 Midcrown, 281 & 1604 at 1717 N. Loop 1604, and Ingram at 6171 NW Loop 410. It was a fun day, and we met some very interesting people. The ARMA San Antonio Chapter has volunteer opportunities available under all Committees Feel free to contact any committee chair you would like to work with. We are always happy to hear from you! Engages speakers to deliver relevant presentations to the chapter for its nine luncheon meetings throughout the year. In addition, committee members ensure that the meeting facility is well-equipped and comfortable, and act as hosts to speakers and guests. Reaches out to prospective members and encourages them to come to the monthly luncheons. Also welcomes new members and offers assistance in getting acquainted with our local chapter and events. Convenes in the spring to compile a slate of candidates for officers and members-at-large of the Board of Directors. Responsible for reviewing applications for scholarships submitted to the chapter, determining approval or disapproval and the amount funded. The Committee also selects books for door prizes for the monthly meetings and the annual seminar. Annually, an audit is conducted to ensure that the funds that are received from various ARMA San Antonio membership fees, fund raisers and contributions are accurately accounted for and a report is presented to the Board of Directors at the September meeting. San Antonio Chapter ARMA Intl.